With an area of ca. 72 square kilometres, the Greek island of Skiathos is not what you would call a big island, but it has a lot to offer to holiday-makers. Apart from a handful of tiny villages, Skiathos Town on the east coast of this beautiful island is the only major settlement. There are also holiday villages for tourists consisting mostly of hotels and other types of accommodation and leisure facilities. Interesting sights on Skiathos include the small Venetian-style fortress of Bourtzi, built on an islet outside Skiathos Town to protect it (unsuccessfully) from pirate raids, and Kastro, a fortified settlement on a steep cliff where Bourtzi’s inhabitants eventually moved to and stayed for ca. 400 years, until piracy in the Sporades was under control. 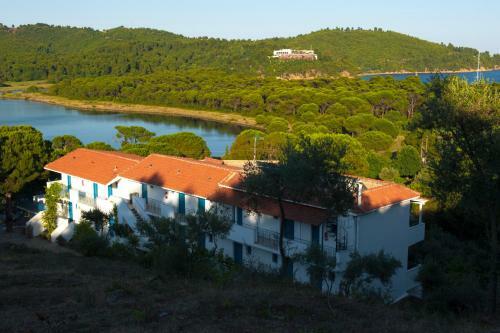 The island is lush and green and has extensive olive groves and pine forests. Skiathos and its neighbouring Sporades islands of Alonissos and Skopelos are generally seen as three of the most beautiful Greek islands. A holiday on Skiathos is perfect for those who want a rest and need to recharge their batteries on the beach, as this Greek island has more than 60 amazing sandy beaches with azure blue sea and crystal clear water. The numerous beaches on Skiathos are easily accessible, some only by boat though, but most people find that the boat trip adds to the attraction. Koukounaries and Vromolimnos Beach are considered the most attractive beaches. On the island of Skiathos a large number of well-preserved monasteries are open for visitors and some of them even offer local produce for sale. The old fortress of Kastro is an interesting sight not to be missed by visitors to Skiathos. Even today, its ruins reveal the remnants of numerous churches. Just below the fortress of Kastro you will find a beautiful beach with a fresh-water spring and a tavern where holiday-makers can sit, enjoy the local food and admire the fantastic view across the sea. The food is excellent and totally fresh. Those who decide to go to the castle by pleasure boat will enjoy the additional treat of a stop-over at Lalaria Beach, famous for its perfectly round white pebbles, the impressive rock archway by the beach and the turquoise colour of the sea. Those who like water sports will love it on Skiathos. Sailing is part of everyday life in the Sporades, and the sea in that region is paradise on earth for boating enthusiasts. At the new harbour holiday-makers can rent a yacht to go on a sailing trip. In Koukounaries para-gliding, horse-riding and tennis are the most popular activities on offer for tourists. For those who like walking, trails through the shaded pine forests, accompanied by the constant song of cicadas, are the perfect choice – and the cheapest too.